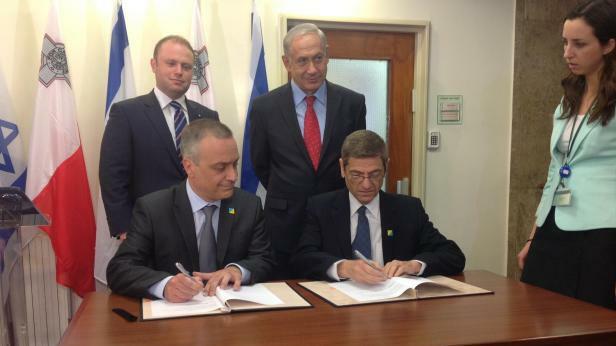 Flashback to October 2013 when Malta and Israel agreed on an action plan for cooperation in healthcare. Malta is among six EU countries singled out for sanctions by the Israeli Foreign Ministry because they are seen as leading and implementing an EU decision that goods made in West Bank Jewish settlements and the Golan Heights should be marked accordingly. The countries are Sweden, Belgium, Ireland, France, Luxembourg and Malta, according to the Israeli Globes news agency. All six countries are also involved in projects to assist the Palestinians. A senior Israeli diplomatic source told the agency, "We see these six countries as having been leading this measure for some time. At the same time some of these countries are involved in various projects to rehabilitate the Gaza strip as well as civilian projects to strengthen the Palestinian Authority in the West Bank. It is important for them to be involved in these processes and so far they have received broad cooperation from Israel. That is about to change and they are about to begin finding difficulties and obstacles."